In GT sector we have 24 schools – 17 in Brazil, 3 in Paraguay and 1 each in Peru, Colombia, Venezuela and Guyana. In Porto Alegre, Brazil one of our schools is Primary level and our Barranquilla school (Colombia) also has Primary level. At present 10 of our schools in Brazil receive full funding from the local government. The school now has 170 children who receive free education. Photo shows Dada Divyapremananda meditating with the children. The school year started in March and we have 21 children in school. We are giving daily refreshments to the children. Local people of this area where our school is located are very happy with our education system. The school also has a built-in medical clinic, where treatments are given to children and adults. A wonderful Education Training seminar was held in our, school with 50 participants. Classes included spiritual philosophy, the art of play, story telling and there were workshops on painting, drama, music and voice. The flow was really inspiring and a lot of practical learning was done. Two more trainings will be held in the beginning of next year in different parts of Brazil. Documentation has been received permitting the opening of the proposed school. The school will begin next year. The new pre-school is running well. Shantimaya writes regarding a yoga teachers training course which has been started to help the school. “The whole Ponta Grossa team worked very hard. 25 people attended the yoga training, 14 are paying and the rest are Ananda Marga members and school staff that also are taking the training. The main goal of this training is to create a nice positive flow in the unit and to raise funds for the school; with the money of this course we expect to run the school for the rest of the year until we get funding from the local government.” Before coming to the school, two of the very young children used to go around the streets with their mother as she collected waste materials to sell. They were suffering from various diseases and psychic problems. 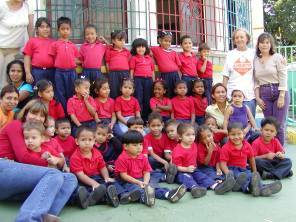 In the loving environment of our school they received medical care, proper nutrition and personal attention. They are now very much improved. Our primary school and 5 pre-schools continue to run well. A teacher training was held for the staff of all the schools which focused on giving the participants an understanding of Ananda Marga philosophy. Topics included Layers of the Mind, Neohumanism and Prout. This project, directed by Didi Ananda Sadhana, began in the year 2000 with the purchase of three and a half hectares of land. Now the second floor of the 160 square-meter AMURTEL Community Centre has almost been finished. The focus of the Centre is to serve the surrounding impoverished rural villages of Barlovento through education, health, agriculture and cooperatives. During April and May, the children of two villages regularly attended a special reading and writing program in which stories, drama and art helped strengthen their literacy skills and their self-esteem. In July, Children’s Day was celebrated in four villages, with clowns, games, songs, and food. This is the fourth year that AMURTEL has celebrated this event with the people of the villages nearest to the centre. For two months during the summer vacation period, a special program was designed for 20 young people of two villages aged 9-12. A bus was hired to bring them twice a week to the AMURTEL Centre where a variety of activities developed their self- esteem and sense of values. Science classes, a field trip, games, stories, reading, writing, art and drama all focused on presenting universal moral principles. The attendance was excellent, and both the kids and the AMURTEL volunteers thoroughly enjoyed the experience. Our Neohumanist Preschool is running now in its 2nd year. Although we couldn’t yet complete the registration with the education department, the quality of the school is getting increasingly better. We have now 9 staff – 1 director, 4 teachers, 3 assistant teachers and the lady who cooks and cleans the school. Forty-five children attend, mostly from low-income families. Nine children are completely sponsored by us, 32 are getting partial scholarship and 4 are paying full fee. Two volunteer doctors are providing free medical care on a regular basis. We also received donations of school materials, food supplies and a cooking stove from sympathizers. An Ananda Marga couple donated all the Christmas gifts for the children. 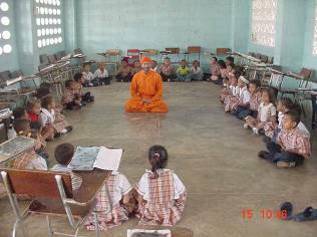 The children practice yoga and meditation and are eager to hear the Circle of Love and other related stories which they then retell and dramatize. They also know a large variety of children’s songs; one of the teachers was a professional singer before. Recently we had a painter give an art workshop to the children. They enjoy creative work tremendously. A member of Ananda Marga is working on a video to present to the public, to explain Neohumanist Education and for fundraising. We still need to increase enrolment of full paying children and after the registration is finished we will be able to ask the government for funding, but until then we depend on donations to keep the school running. Since several years Ananda Marga owns a 16 hectar piece of land in La Parreña, in the mountains of Yaracuy, about 1300 meters above sea level. Part of the land is planted with coffee which is the main crop in this area. The people living in the neighbourhood of our Master Unit are suffering from multiple neglects. Transportation has become a real problem, one time going up and down the mountain by jeep costs about the amount of a 3 day salary of a worker in the coffee plantation and walking down the mountain by foot takes anywhere from 1 to 2 hours. The living costs have increased tremendously because of the inflation, but the salary of the workers has almost remained the same. Since the increase of the transportation costs most of the children have stopped going to school. Most of them are girls and Didi Liina who is working in the Master Unit has given individual classes to them in order to help them pass to the next school year. Two of the girls are walking every day to school and another two have moved to Caracas with us to stay with the Didis permanently. After seeing this situation, myself and one of the sympathizers who has helped us to cover the costs of cleaning our land for the last year, have forwarded part of the money to buy a house in the village for our caretaker´s extended family. They will pay it off gradually, and at least the children will not have any more problems attending school. The property is located right in front of it. We also bought another piece of land in the village of Tartagal for the Didis, since staying alone up in the mountains is not very safe and also is very lonely. The land is plain with a beautiful view towards the mountains, it is also very fertile and much easier to cultivate. We already planted many fruit trees and the construction of the house is almost finished. In the near future we would like to start a small industry with aromatic and herbal plants to help generate income for the many unemployed women and adolescents in the area. If you are interested in sponsoring a child or work as a volunteer in one of our project, please, contact Didi Ananda Amegha – e-mail: amegha@etheron.net. You can also send a tax deductable donation through our AMURTEL office in Vermont.